It pretty much came down to a proverbial coin toss. 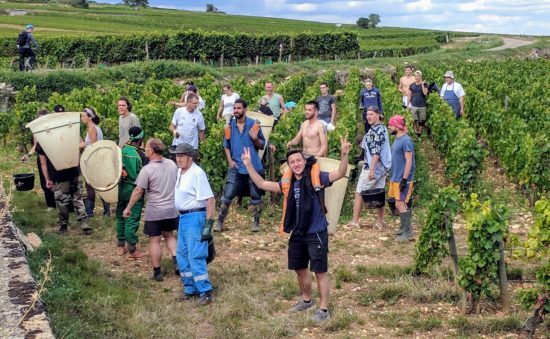 Do we spend a week in Dijon, or do we spend a week in nearby Beaune, which is where we had booked a bicycle tour through the Burgundy Vineyards. In the end, Dijon won the toss. 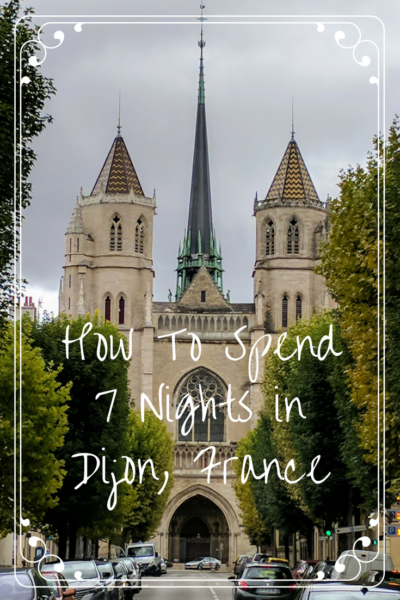 Dijon turned out to be the quintessential French experience and we loved every minute. 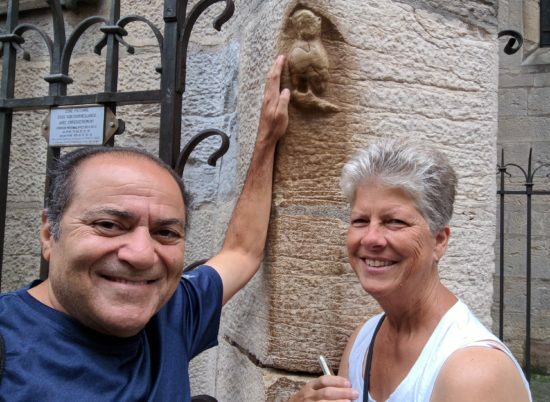 I have to tell you that as much as we love Portugal and enjoy our part-time Portuguese expat life, we could easily live in France and be as happy as we are when in Portugal. Seriously, what is not to love about the French lifestyle? The history, the food, the architecture, the people, the culture, it’s all there. Oh, and did I mention the bread? 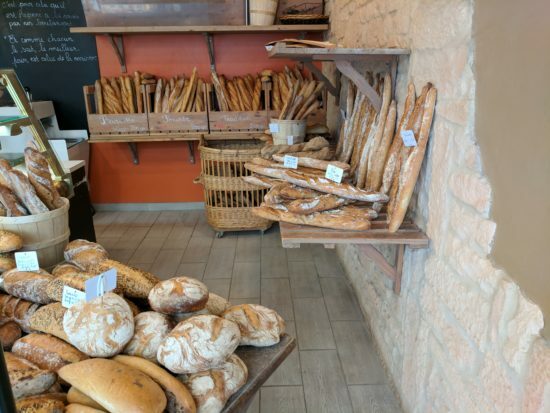 The bread alone is reason enough to live in France! We spent seven nights in Dijon and thoroughly enjoyed each and every day. Like we do in every place we land, we simply started walking each morning and let the day unfold as it may. It’s the best way to see a city because you just never know what you’re going to find. And, if you only zoom by in a car or a bus, you’ll miss so much. With that being said, Dijon does have good public transportation with a sleek and modern metro system. And, the city boasts the cutest little pink electric buses, which navigate the narrow streets with relative ease. 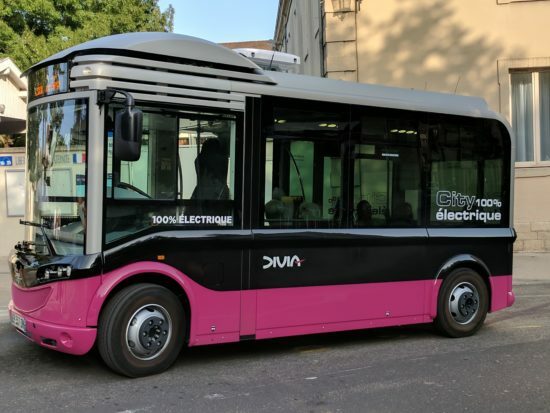 Electric pink buses that navigate the narrow streets of Dijon. The mustard shops – Dijon Mustard – are all the rage in the historic core of the city. I’m not someone who normally enjoys mustard, but Abi is a fan. We tasted more mustard in our days in Dijon that I’ve eaten in my entire life. Conjure up a tasty version of mustard, and you’ll find it in the shops. Everything from tarragon, to port wine, to honey, to mushroom, to peppercorn… well, you get the idea. As, I understand it, the not-so-secret ingredient that makes Dijon mustard truly Dijon, is the acidic juice of not quite ripe grapes, rather than vinegar. Who knew? We visited the Edmond Fallot Mustard shop more than once. There is a legend in France about a wise old owl. If you rub the owl with your left hand and make a wish, it’s sure to come true. Now, I don’t know if that’s true because Abi didn’t tell me what he wished for, but it’s a great story just the same. Turns out, following the owl trail is the best ways to explore Dijon. Poor owl, after centuries of having his face rubbed, he doesn’t have much of a face left! That, and the poor little owl was vandalized a couple of decades ago so now he is constantly monitored by camera. One must make a wish while touching the owl with the left hand. Abi didn’t tell me what he wished for! 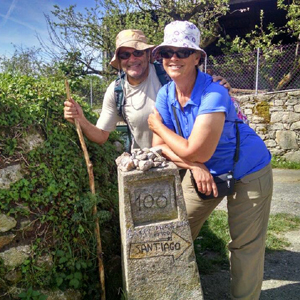 I think if we had followed the trail map without stopping it would have taken a couple of hours. But what would be the fun in that? It was a bit of a treasure hunt, finding the mapped locations and then exploring said locations. Each day we’d pick up the trail and find a few more spots to explore. Some of the highlights included the Palais des Ducs de Bourgogne, Musee des Beaux Arts, the Halles and several churches. The Owl Trail map can be purchased in the tourism office. From Dijon to Beaune it’s an easy 30-minute train ride. If you ever find yourself in the Burgundy region of France, we can attest to the great fun of spending the day riding through the vineyards. We enjoyed a day of not only riding bicycles through the lush vineyards, but also taking part in three wine tasting stops and a delicious lunch. Aside from me aching arse, after 16 miles on the bicycles, it all made for a wonderful day and we were lucky enough to see the beginning of the harvest. Harvesters posing for the camera. 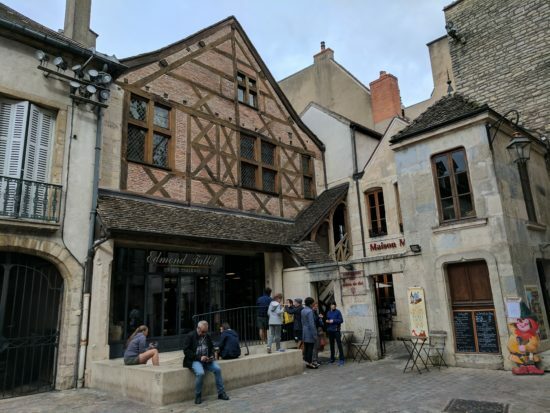 If/when we return to the region, we would definitely plan to spend a few days in Beaune because it was seemingly as charming as Dijon with lots of nooks and crannies to explore, but we think we made the right decision, for this trip, to base ourselves in Dijon. To sum it up in just a few words, if you think Dijon is only about the mustard… think again! We stayed at the Aparthotel Adagio access Dijon République. The WiFi was not the best but the room, the staff and the location fit our needs nicely. The Gare de Dijon Train Station is centrally located and the local public metro system – and the buses – stop at the station. The local trains between Dijon and Beaune run multiple times each day. Depending on the train, the ride can take 20 to 40 minutes. It’s an easy walk from the Beaune train station to the historic city core and it’s an easy day trip. 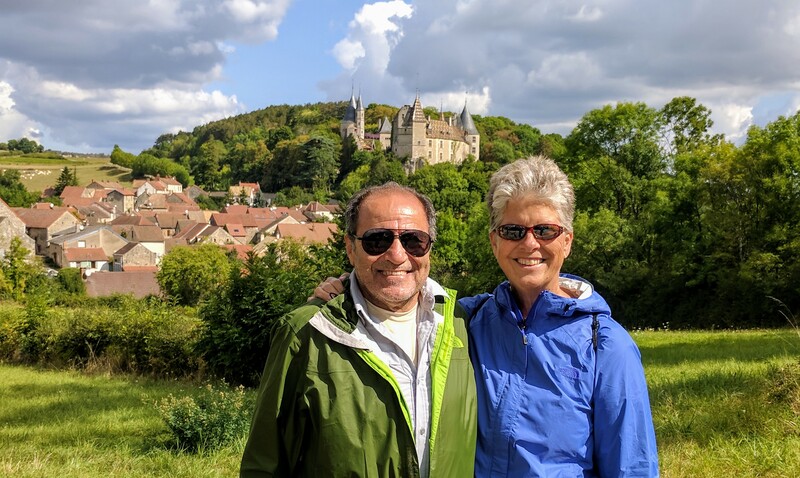 We took a bike tour with Active Tours in Beaune. You can read about our day here. 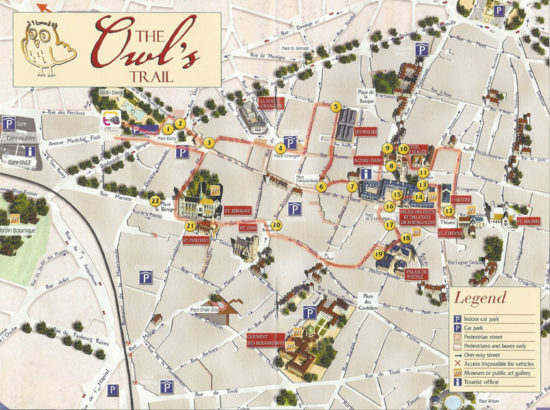 The Owl Trail Map is available for 3,50€ from the tourist center. Dijon has a population of about 150,000 while Beaune has just 21,000. Take that in to consideration when planning where to stay. For us, staying in Dijon offered many more options as a base from which to explore. Patti, once again I have Pinned your post for future reference. Dijon sounds appealing on all fronts. Thanks for the info. That’s great, Suzanne! I’m glad you found the post helpful and I really hope you make it to Dijon. It’s all kinds of charming. 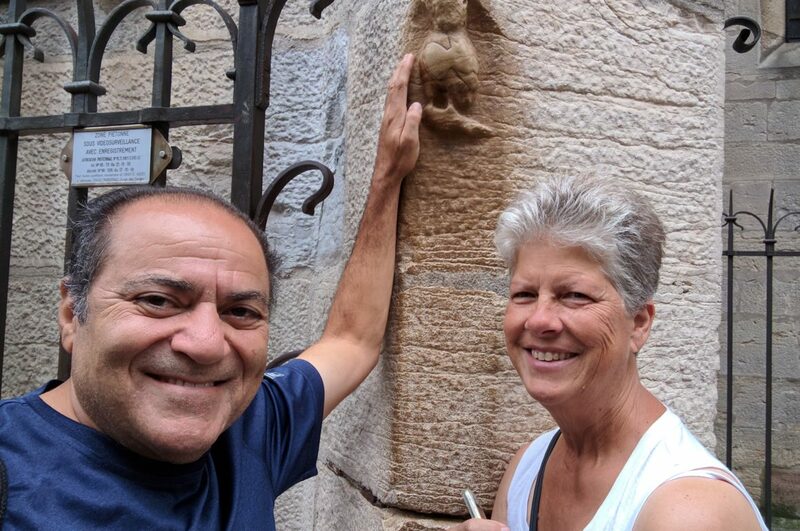 I agree, Gilda, there is SO much to experience in France; it is a beautiful country. I love Dijon mustard (and almost every other kind as well) but up until your post pointed out my sad lack of knowledge, that’s been my only brush with the region. 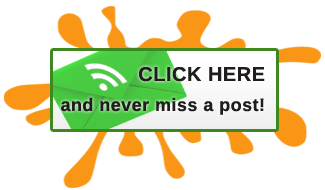 I’ll echo Suzanne’s comment and tell you that your post is now pinned for future reference! The city sounds beautiful and I think following the owl trail and spending your days walking about sounds like a great way to learn about it. It’s hard to picture bread better that our Portuguese loaves but I loved your photo of the freshly baked bread and will take your word for it until I can try it for myself! Dijon is the only mustard I care for. I had no idea there’s so many kinds; the wine and mushroom both sound tasty. Fantastic area to explore, it’s added to my list. We definitely brought a few mini jars of mustard home with us, made for great stocking stuffers! We’d love to return one day but there is always someplace new to experience, it makes it hard to return for 2nd visits, although we’ve never said no to France. Dijon is a fabulous place to stay. I have done so twice the markets the food the restaurants superb. Try renting an apartment it is the way to go. It is indeed a fabulous place to visit/stay, Maree. Thanks for reading!